SB on food, frame, fluid, and feasting. The latest issue of Food and Wine has a section on food trends, and they cite chef memoirs and food writing in general as a major fad. 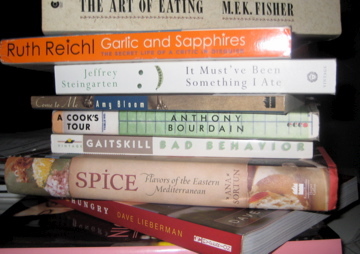 Impossible to argue, the popularity and available quantity of food writing has exploded over the past few years, and with it the arrival of many more “best of food writing” lists – best cookbooks, best essays, etc. Today I’m giving you my own list, a compendium of some of my favorite food-related words. Absolutely none of these books are new, and some are downright old. But they are all good. The Man Who Ate Everything, Jeffrey Steingarten: The epitome of the food curmudgeon, his written voice is hysterical and salty. Bad Behavior, Mary Gaitskill: This collection has nothing to do with food, it’s just so chewy and dense that reading it feels like eating an enormous steak. Garlic and Sapphires, Ruth Reichl: What I love about Ruth’s books is that they aren’t just about food, they are about her life, her family, her neurosis. This book does an excellent job of combining all of these things. Come to Me, Amy Bloom: This collection is not about food, but Ms. Bloom writes so lusciously it may as well be. She also tends to use food words as descriptors. The Art of Eating, MFK Fisher: Ms. Fisher, the grand dame of food writing, is not nearly as well-known as she should be by the newcomers in today’s food-as-trend culture. Two of my favorites in this collection – “Love Was the Pearl” and “A Lusty Bit of Nourishment” from Consider the Oyster- should be required reading for anyone who wants to have anything to do with food. American Food Writing, An Anthology: Edited by Molly O’Neill: A hefty tome, filled with essays from the likes of JA Brillat Savarin, Julia Child, Emily Dickinson, and Walt Whitman. One of my favorites is a ridiculously simple recipe for Beef Stroganoff from James Beard. Nigella Express, Nigella Lawson: No surprise, I love Nigella -I’m sure I’ve mentioned her before. She’s gorgeous, funny, and (seemingly) down to earth. Her recipes in this book are often credited to some of her favorite cookbooks- in this way she makes you feel like you are part of the art and history of cooking, not just listening to her narrow take on cupcakes. Spice: Flavors of the Eastern Mediterranean, Ana Sortun: I love Oleana, I love Sofra, I love this book. I’m lucky enough to have heard Ana Sortun speak about food – she makes you want to run home and cook. My favorite recipe is something that she makes at Oleana, Deviled Eggs with Tuna and Black Olives. Forget everything you ever knew about deviled eggs. Now go buy some Christmas presents.